Sources within the White House reported that general mayhem broke out after crackpot dictator and the only obese man in North Korea, Kim Jong Un, made his now infamous claims that North Korea could strike anywhere in the US with nuclear weapons, and that he had the launch button on his desk. Speaking on the condition of anonymity, a highly placed official told Article 107 News that President Trump was incensed that the Supreme Leader had such a button. The football, of course, refers to the secure briefcase in which the Presidential launch codes are kept in the event that a nuclear strike becomes necessary. The football is kept close to the President at all times, but our source claims that it’s not enough. Construction of a physical button began within hours of Kim Jong Un’s declaration. The button is said to be massive in scale, taking up an entire wall in the Oval Office. Our source confirms that the button is bright red, and has the word “LAUNCH” written in giant bold letters across the middle. Though the actual launch codes are still kept in the football, President Trump was quick to take to Twitter to declare victory over the Hermit Kingdom. When asked whether or not the button actually worked, our source was quick to deny that it had any real functionality. 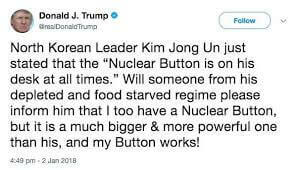 Nonetheless, he was adamant that the construction of the button represented a tremendous improvement in America’s nuclear capabilities, and is a crushing blow to North Korea. Critics of the Trump regime are less optimistic. When asked to expand on her statement, she was forced to excuse herself on the grounds that yet another Democratic Congressman was under pressure to resign for sexual misconduct. Not content to allow Trump to have the more impressive button, Kim Jong Un announced construction on a new, improved button of his own. However, unconfirmed reports out of Pyongyang state that an accident during construction has devastated much of the city. Damage estimates range in the tens of dollars.